Heart rehab with Allon Kirschner a man who really cares! 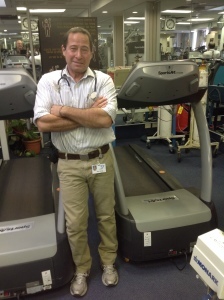 Allon Kirshner is a certified cardio-therapist @ Shari Tzedek hospital in Jerusalem. How did you start doing this work, and what makes you enjoy this? What have you done in the fitness field since you made aliyah? What are your goals in training people? “I believe my role is both in prevention and guiding people back to health after a heart attack or stroke. In each case I take blood tests and evaluate the patient’s need for healthy lifestyle intervention. My goal is to teach people that they are responsible for their own health. 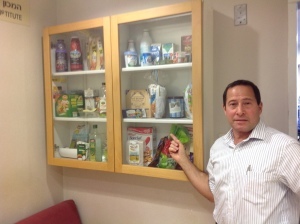 We teach proper balanced nutrition at our clinic! Allon endorses the importance of regular exercise and eating right. “I am a strong believer that every person from the age of 25 and up should have a complete blood test, because it’s a ‘Health Lie-detector.’ It must include their blood pressure, lipids, cholesterol, triglycerides, sugar, glucose, A1c hemoglobin especially for children to detect early possible diabetes, and Vitamin D levels. Here is one of my favorite websites on health!